The 9 day overland group tour and safari from Johannesburg to Victoria Falls includes highlights such as the Okavango Delta, safaris in Chobe National Park and of course the world famous Victoria Falls in Zimbabwe. 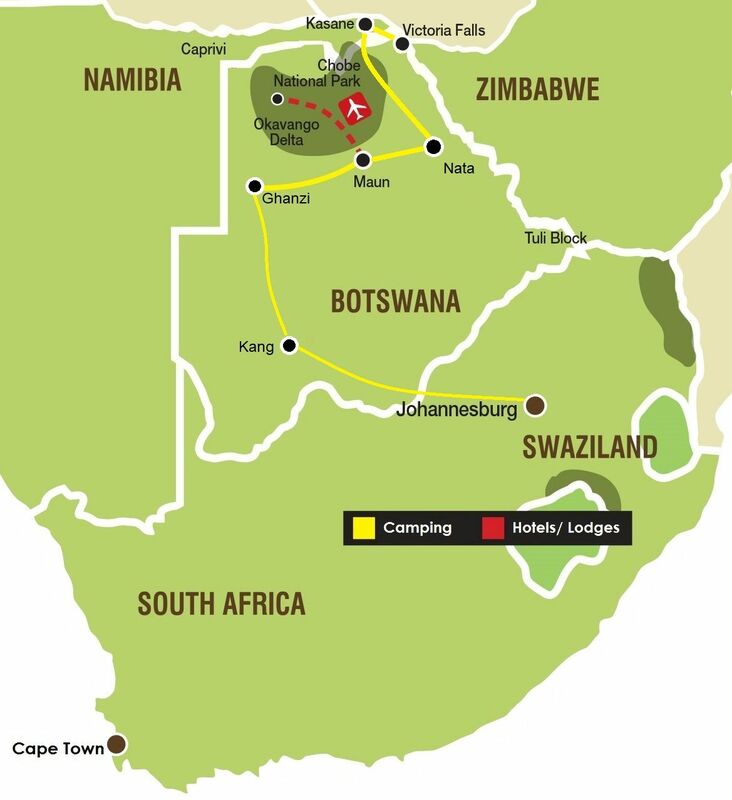 The tour conveniently starts in Johannesburg in South Africa and quickly crosses the border into Botswana. We travel through parts of the Kalahari to Maun - the gateway of the Okavango Delta. After the Delta excursion we continue our journey North to Chobe for some safari experiences on land and on the water. The group tour ends at one of the 7 wonders of the world - the Victoria Falls in Zimbabwe. Our group tour and safari from Johannesburg to Victoria Falls begins as we leave the city of Johannesburg. On day one we travel through the North-West Province to the Botswana border. After completing border formalities we continue on the Trans-Kalahari highway to our overnight stop in Botswana. After breakfast we venture deeper into the Central Kalahari and our camp in the Ghanzi district, here we will spend time getting to know the fascinating San people (aka Bushmen). This afternoon we will join our San guides for a guided walk that will introduce us to the many secrets of their survival in the Kalahari Desert. The nomadic San are hunter-gatherers that have passed down a rich knowledge of the plants and animals that play such an important part in their lifestyle. This evening we will get a first-hand experience of the San culture, well known for its rich traditions of song, dance and story-telling. The most rewarding and enjoyable way to explore and experience the beauty and serenity of this intricate system of lily covered channels and lagoons, is by mokoro (dugout canoe). Heading out early, we will be transferred by safari vehicle to the poling station (approximately 1 hour transfer) where we will meet the polers who will be escorting us into the Delta. The polers will steer us through the serene area of narrow, reed lined channels which open out onto beautiful lagoons. Reaching one of the many islands, a nature walk may be taken with your poler. After the walk, we return by mokoro through the channels back to the mooring station. While the mokoro trail is not primarily a game (wildlife) viewing activity, a variety of game may be encountered in this pristine wilderness area including elephant, giraffe, kudu, impala and zebra. Please note: Those guests who have pre-purchased the Okavango Delta upgrade package will be transferred into the Delta this morning and will re-join the group on the morning of day 6. For all the details, click here. Our journey today takes us across the northern reaches of the Makgadikgadi Pans, lined with majestic examples of the iconic Baobab tree. Our activity package will afford us the opportunity to enjoy an afternoon guided excursion to the Pans and Nata Sanctuary to appreciate the spectacular view and sundowner (having a drink while enjoying the sunset). We rise early this morning as we continue north to our camp on the banks of the Chobe River. This afternoon is set aside for exploring the Chobe National Park. We begin our safari in 4x4 vehicles, which allows us an up close and personal experience with the many elephants that frequent the river in the afternoon. Our day ends with a leisurely boat cruise and a meal served around the campfire. With the many activities on offer in Victoria Falls, today is the perfect day for the adventure that most suits your style. Whether rafting the mighty Zambezi River or enjoying a scenic flight over the falls below, this is your day to enjoy the many attractions on offer in Victoria Falls. Your tour officially ends after breakfast.